"This salmon is bursting with flavor and very tender. It's easy to make and clean up, and the capers add an extra zing! Be careful when opening foil, as the steam is hot!" Loved this recipe. I doubled it, but still cooked in foil. Next time I make 4 servings (or more) I will instead use a baking dish covered in foil. It took less than 1/2 hour to cook. This was the first time I'd ever cooked salmon so I was looking for a simple recipe. I didn't make any changes to the recipe provided and I really enjoyed it! Delicious and FULL of flavour! We used very fresh salmon which made the recipe that much more perfect. 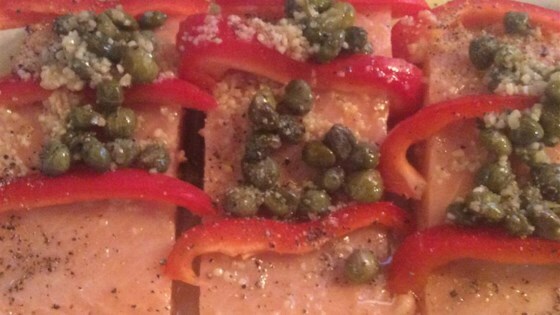 Definitely include some capers if you have them for a boost of flavour. I love this recipie! I made it for my husband and he said "it tastes like a gourmet meal." I made it once with the sweet pepper and once without, it is much better with!